This Qods Day flyer reads: "We are all together!" 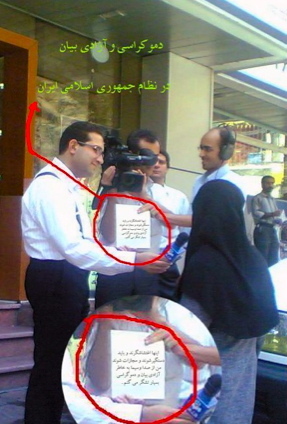 To see more examples of the flyers being circulated in Iran for Ruz-i Qods protests, please see the link below. "Rally to Protest Violence on Qods Day! "—To see more of the creative and colorful flyers for the Qods Day protests, click the link below. 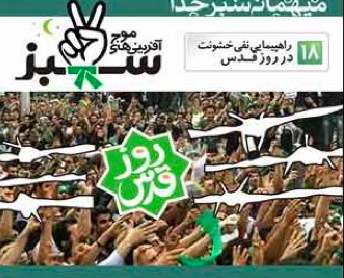 * Click here (Ruz-i Qods Flyers Show) to see a colorful array of words and designs on the flyers that, despite the censorship, have been designed and distributed by Iranians announcing tomorrows rally as an uprising against dictatorship. The second sculpture of Neda Agha-Soltan, entitled "The Angel of Freedom." Please click the link to the right for more information about this second sculpture of Neda. * As Iranians prepare to put themselves in danger again to voice their protests in another big rally tomorrow, let us remember Neda Agha Soltan, the Iranian woman killed by the Basij forces on June 20th 2009, and hope this time it will be more peaceful. * Paula Slater, the artist who built a beautiful bronze bust of Neda Agha-Soltan before, has sculpted a new portrait bust of the woman who has come to be know as the Angel of Iran. Click on the second attachment to see the new and beautiful piece, this time in clay, with Neda’s hair free and natural. To read about the artist and her work, visit: http://www.prlog.org/10335368-paula. Please forward this message and website https://windowsoniran.wordpress.com/ to your friends in Iran and elsewhere in the world and send your thoughts and prayers of peace, and support, for tomorrow in Iran. 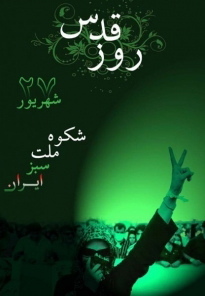 Keep spreading the word about the September 18th "Ruz-i Qods" Green Rally!!! Please post this flyer to your blog, facebook page, or website. And, see below for lots of new and important information! All signs point to the fact that difficult – and decisive – days may be ahead in Iran. But the good news first. For years, Iranians who are ranked as number four bloggers in the world, have been prevented from visiting the sites that the Iranian government has considered containing information contrary to its interests and filtered. Those who devised creative ways to break the filter and get into such sites, are usually in danger of being found and subjected to jail and other punishments. What is most amazing is that the Iranian government considers the existence of undesirable websites as “foreign interference” in its internal affairs. * Here is the site that gives you instruction for downloading the Green Machine. According to Mr. Mousavi’s facebook page, after you download the Green Machine, you can visit any website – filtered or otherwise – without being detected: http://greenmachine.s3.amazonaws.com/green.html. * Dr. Ali Reza Beheshti, Professor of Political Science in Tehran University and chief consultant of Mr. Mousavi’s election campaign, who continued his efforts by heading the group that Mousavi formed to follow up on physical abuses in the Iranian jail, has just been arrested. 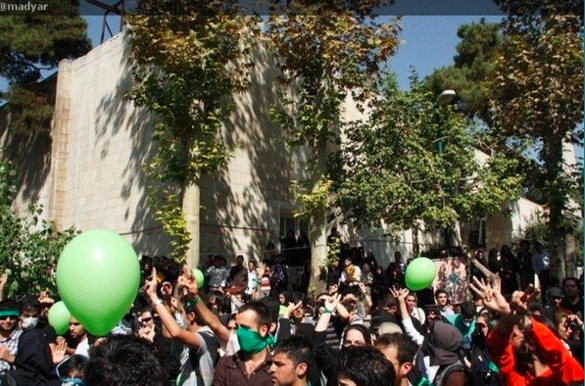 Mr. Mousavi issued a statement (no.12) to condemn the arrest. He predicts that other grave attacks are on the way: http://www.rahesabz.net/story/1301/. For the English translation on Mousavi’s Facebook, visit: http://www.facebook.com/note.php?note_id=134451867605&ref=mf. 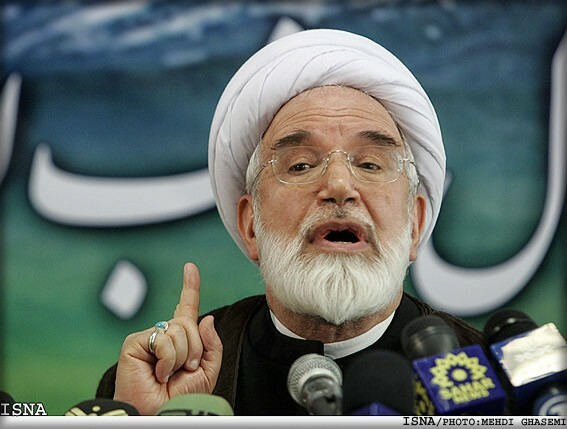 * There are strong – unconfirmed – rumors that the Iranian Supreme Leader Ali Khamenei has already issued the order for the arrest of the reformist leader and presidential candidate Mr. Mehdi Karrubi. While this is a very likely move at this point, it is also possible that the rumor is spread in order to test the public reaction. 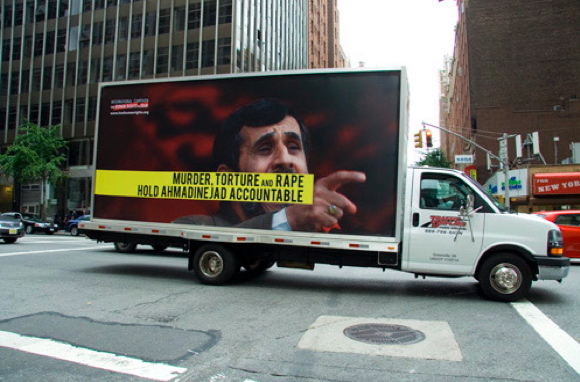 * President Obama’s spokesperson has made it clear that in his journey to the U.S. to speak in the United Nations this month, Mr. Ahmadinejad will NOT be invited to the official party that the United States will throw for the world leaders. Leading Islamic intellectual Dr. Abdol Kareem Soroush (or, Dr. Abdulkarim Soroush). * The renowned Iranian reformist thinker, Dr. Abdol Kareem Soroush who has been controversial with his criticism of the Islamic Republic over the past two decades, has written an open letter to the Supreme Leader. The letter criticizes the leader for his response to the protests and predicts the fall of what Soroush calls “Islamic Dictatorship”: http://www.rouydadnews.com/pages/150.php. posted this: Green Mousavi Banner on Highway Bridge! A beautiful painting by Nasrin Khosravi. Please click the link to the left for more of her wonderful work. * Because, I opened this window with an anxious tone, and because I am preparing it on the tragic day of September 11, I would like to close it with the soothing watercolor work of an Iranian woman painter, Nasrin Khosravi, who – in this series of paintings – has celebrated peace and serenity with images of people, flowers, doves, and more. 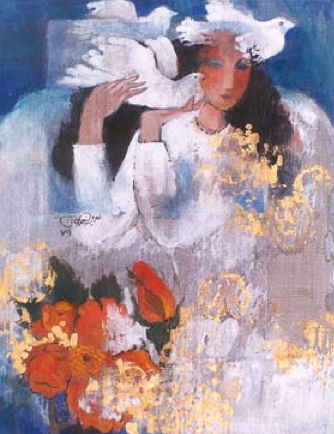 Click here for a presentation of her work: Nasrin Khosravi Paintings. Enjoy! Don’t forget to share https://windowsoniran.wordpress.com/ with friends. Flyer for the September 18th Green Movement Rally. Let me welcome you to Window 91 on Iran and proceed to our first news item. As you will see, there is a lot going on in Iran. * Yesterday, Mr. Mousavi released his Statement No. 11, a historic one in its scope and planning details. The statement is a clear indication that the Green Movement is pulling itself together and preparing for long term resistance. For both Persian and English versions of the content of this statement, visit: http://www.facebook.com/note.php?note_id=132573722605&ref=mf. * The government of Mr. Ahmadinejad has been canceling public events related to the month of Ramadan in order to deny the public any opportunities to gather. The Greens are now looking forward to the rally planned for September 18. The flyer is on the right. * Literally hours ago, security forces broke into the office that Mr. Mousavi’s camp had set up to collect information about those killed or injured during the post election protests. This office, which was run by Ali Beheshti (son of the deceased Ayatollah Beheshti and a spokesperson for Mousavi’s camp) was viewed as one of the few places in which people felt safe to speak about what actually happened to them. This is yet another sign of aggression by Mr. Ahmadinejad’s government demonstrating its inability to govern by any means other brute force: The question is for how long? See: http://norooznews.org/news/13807.php. * Anyone who is in close contact with Iran notices a fundamental change since the election: previously, Iranians were afraid of the government. Now, the government is afraid of the people. Everything that the current government does is an attempt to undermine this new spirit of hope for change. * As the regime blocks normal channels of communication, Iranians are consistently a step ahead inventing new and creative ways of communication to keep hope alive. The latest is writing slogans in support of the Green movement on Iranian bank notes (see the examples below). Iranians have developed some very creative ways to protest even as the regime continues to crack down. For example, one of the new ways to express support for the Green Movement is to write it on the Iranian government's money! * You can participate in keeping Iranians hope for a green and peaceful transition to democracy alive by wearing a green wristband. * The latest news from Iran indicates further opposition by major religious figures in Qom to Mr. Ahmadinejad’s government. There are indications that a new statement by these Ayatollahs is on the way: http://mowjcamp.com/article/id/27115. * In a courageous interview with newspapers, Abdullah Ramezanzadeh, the spokesperson for Khatami’s camp, who was arrested soon after the elections said that after 80 days of solitary confinement, he is still in the dark about the accusations against him. He said during the arrest there were serious injuries to his head and ribs and his cell condition is pretty bad. According Mr. Ramezanzadeh, during the interrogations that usually go from 10 pm to 4 am, even though he is blindfolded, the interrogator sits behind him. He also said he was told his conditions would improve if he made public confessions. In a highly unusual move, the judge ordered the security forces to leave the court room so Mr. Ramezanzadeh would be able to speak freely: http://www.parlemannews.ir/index.aspx?n=3245. The script he is holding reads: "These are rioters. They ought to be arrested and punished. I thank the Iranian National TV for impartial reflection of view points." Now, to see the varieties of natural green from Iran, and to close this window on a green note, click here “The (Naturally) Green Iran” for the very short slide show that I have prepared for you from the latest photos of Iran. I will leave close this window with this beautiful picture of the Iranian (Green!) countryside. 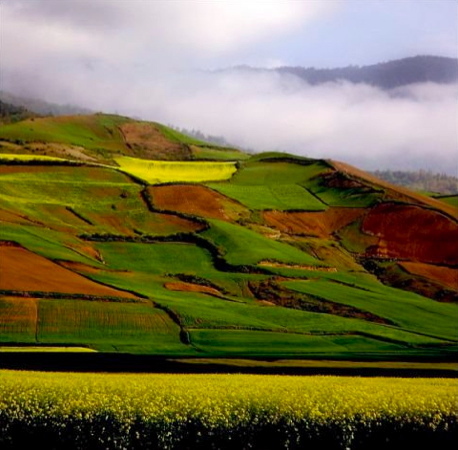 Please click on the "The (Naturally) Green Iran" link above for more stunning photos.